(Newser) – The first two Democratic presidential debates for the 2020 election will have two heats with room for a total of 20 candidates who meet certain polling or grassroots fundraising thresholds, the AP reports. A senior Democratic National Committee official outlined the framework Thursday for the June and July events, which party Chairman Tom Perez has promised will ensure fairness for all potential candidates in a growing primary field that could approach two dozen candidates. Candidates can qualify by reaching 1% support in at least three national or early primary state polls. They also can qualify by collecting campaign donations from at least 65,000 individuals, with at least 200 unique donors in at least 20 states. Party leaders said they will not go beyond 20 candidates. If more than 20 candidates meet both qualifying thresholds, the DNC would use candidates' polling averages to weed out potential debaters. NBC, MSNBC, and Telemundo will broadcast the June debates on back-to-back nights. 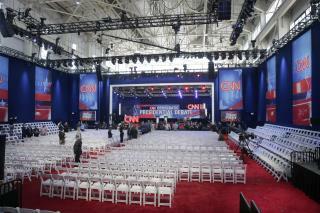 CNN will broadcast the July debate on back-to-back nights. Dates and locations will be determined later. Candidates will be assigned to the respective stages by a random drawing. The details of that drawing will be announced ahead of the debates, but Perez has said the intent is to avoid having the party separate perceived top-tier candidates from a second tier, as Republicans did during their 2016 nominating fight. Party officials say this is the first time they know of a major party using grassroots fundraising as a debate-qualifying threshold. Polling alone, they said, likely would be an unfair standard in what stands to be such a large field with so many candidates who could be polling in low single digits—at or near most polls' margin of error. The June and July debates will be the first of at least a dozen primary debates sponsored by the party. There will be no debate in August. Monthly debates will continue September through December. Then at least six more debates will be held in 2020, with additional debates added later in the spring if the nomination is still in question. The actual criteria for participation: does AOC (All-Over-Crazy) support the nominee. This will be a primary campaign of who can track to the extreme left better than the others...who is the nuttiest in a nut bag full of AOC wannabees. Elections are too expensive and last too long.